Allan Zavod is an Australian pianist, performer, composer, jazz musician, arranger, producer, music director and conductor whose career has mainly been in America. Married to author-artist Christine Zavod, he has one son, Zak. As a musician he has moved across genres from classical to rock-fusion. Today he is considered an Australian pioneer in the classical-jazz fusion genre, where he embraces a unique creative blend of improvised jazz and classical music. Often described as a keyboard wizard Allan Zavod completed a music degree where he was classically trained at Melbourne Conservatorium (University of Melbourne) in 1969, after being awarded the prestigious full Ormond scholarship. His talent as a pianist was recognised by Duke Ellington, who after hearing him playing jazz piano arranged for him to further his jazz studies at famed Berklee School of Music (Boston, Massachusetts, US), where he later held a post as professor of music. Based in the USA for 30 years he played, recorded and toured with many well-known international musicians such as Duke Ellington, Glenn Miller Orchestra, Woody Herman Orchestra, Maynard Ferguson Big Band, Cab Calloway, Billy Cobham, Gary Burton, Herbie Hancock, Jean Luc-Ponty and George Benson, culminating in a 1984 world tour with the legendary Frank Zappa. 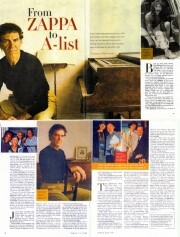 America's music bible "Downbeat Magazine" named Zavod one of the USA's Top 10 Keyboardists of the 80's. He has received grants and commissions to compose, orchestrate and perform original works throughout the world. Representing Australia in 1987 he (as composer) and Kate Ceberano (as singer) won the Asia Broadcasting Union Popular Song Contest in Kuala Lumpur viewed by an estimated audience of 500 million. In 1988 the Australia Council commissioned him to compose "Concerto Australiana" a classical/jazz fusion three movement work for piano, orchestra and jazz ensemble which was performed at the Bicentennial Australia Day Celebrations, live on ABC television at the Sydney Opera House. As a teenager in 1968 he performed for Her Majesty Queen Elizabeth at Government House and in 1988 performed a work for piano and jazz choir before H.R.H Prince Charles and the late Princess Diana for the Melbourne Youth Music Council. Shortly thereafter there was an Australian Girls Choir commission for a jazz work and a composition for the Victorian Youth Symphonic Band. In 1996 Zavod composed a stirring sound scape for the stage adaptation of J.R.R Tolkien's "The Hobbit" which enjoyed huge success throughout Australia then and again in 1999. In 1997 Symphony Australia commissioned Zavod to write "Concerto for Trumpet, Jazz Trio & Orchestra" for trumpeter James Morrison to open the Adelaide Symphony season. They enjoyed 4 further sell out performances in 2001 at the Sydney Opera House with the prestigious Sydney Symphony Orchestra. A tour of the work with major European & Chinese orchestras featuring James & Allan occurred in 2002, which included an April performance in Munich with the Munich Symphony. As a film composer Allan has written scores for over 40 American and Australian films, documentaries, television and theatre, including: a US film score with famed guitarist Eric Clapton; an award winning children's film for "Shine" director Scott Hicks; a film for Disney; the Theatre production of The Hobbit; and the long running series "A Country Practice". For several years he was a judge of the Australian Film Industry Awards. Concert performances; producing and music directing here and overseas for popular artists as well as Network Ten's "Good Morning Australia"; monthly writing for national music magazine "Australian Musician" occupied Zavod's time annually. In 2009 The University of Melbourne awarded him the Doctor of Music for his international contribution in the field of Classical Jazz Fusion, only one of 5 recipients with an earned Doctorate for composition in the 150 year history of the University. Further commissions for 2001/2 saw Allan Zavod compose major orchestral works to include a trombone concerto for soloist James Morrison (Australia Council grant) performed with the Australian Youth Orchestra and the Adelaide Symphony Orchestra in 2002. Zavod was a pioneer in a compositional style that combines classical and jazz genres, where musicians from both worlds share the same concert platform equally. Allan received an award from the Australian Composers Guild in recognition of his work in Jazz/Classical composition for which he is considered to be at the forefront. He composed a Walt Disney production after having just completed a short tour with ex Hot Chocolate Emmy award winning jazz saxophonist John Altman. In 2001, Zavod produced and help launch Judith Durhams "Land of Today"
Not long after he got back from performing in Hawaii with old friend George Benson, Zavod performed Rhapsody in Blue at the Melbourne Concert Hall and Sydney Opera House with the Australian Pops Orchestra. In December 2001 Allan performed an all Gershwin concert in Florida on the new Blue Steinway piano called "Rhapsody" built in honour of George Gershwin to celebrate 100 years of Steinway. In 2002, The Zavod Classical- Jazz Fusion Composer Music Scholarship Award was created by Allan Zavod in collaboration with The University of Melbourne - in the memory of old friend Noel Castan. In 2010, The Zavod Classical- Jazz Fusion Performers Music Scholarship Award was created by Dr Zavod with the support of Patron Dame Elisabeth Murdoch AC, DBE and administered by Monash University. These awards encourage young artists to create works that demonstrate a true fusion of classical and jazz styles. It is a great opportunity for young tertiary Australian students to get much needed financial assistance, as they strive to become our future Australian composers and performers. From 2005-2007 Zavod was living in America. From 2007-2012 he was devoted entirely to composing. During this period his orchestral works were performed here and overseas. As an educator, Zavod has given lectures, master classes and workshops at universities in America and Australia and to Aboriginal students in schools in Northern W. Australia. He devised and taught an elective in classical-jazz fusion at University of Melbourne. His Concerto for Trumpet, Jazz trio and Orchestra manuscript and CD was used by the Education Department of NSW in HSC Cariculum in all high schools in NSW. Australia. Zavod wrote monthly music lessons for 'Australian Musician' Magazine for 15 years. As a pioneer in the classical-jazz fusion or 3rd stream genre, he has two student music awards in his name. Allan has now written concertos for Australian artists such as James Morrison, Slava Grigoryan, Diana Doherty and symphonic works for American, European, Asian and Australian Symphony Orchestras. Throughout a distinguished career, Zavod's works have represented Australia and have been performed for Prime Ministers, Royalty and Heads of Country & State, Foreign Dignitaries, Government Bodies/Departments, Universities and Charitable Organizations in many countries, most recently for H.R.H. Prince and Princess Norodom of Cambodia. Some of these notable events were: Australia Post - "Face of Australia"; the 2000 Sydney Olympics (performed original composition for International Olympic Committee); fund raisers for the Dalai Lama and other charities; the Centenary of the Nobel Peace Prize for the Red Cross; and in New Orleans to commemorate Hurricane Katrina. In 2010, a performance of his 5 movement Environmental Symphony narrated by Sir Richard Branson with words by eminent scientist Dr Alan Finkel, synchronised to visuals, was the centre piece for the Prime Minister's Banksia Environmental Awards. Highly sought after as a performer, he has played with musicians as diverse as Sting and violin viruoso Nigel Kennedy to celebrated comedian Robin Williams and renowned "Fiddler on the Roof" star Topol. He has played at the revered jazz festivals around the world and for the last couple years has been heard performing smooth, lively jazz at regular gigs at the intimate Cafe Latte & The Marquee Lounge in Toorak, Melbourne. In 2015, at the age of 67, the Toorak resident's career was going strong. He had just performed in Italy and Turkey and was scheduled to perform at the Melbourne Recital Centre, but fell ill upon his return. Despite few warning signs, the diagnosis was dire, an inoperable, stage-four brain tumour..
"It was a huge shock; life changed completely," says Allan. "One positive is that my wife, Christine, through her devoted care, has enabled me to do what I like all day.". Now that Allan is facing his own battle with glioblastoma. He credits his wife of 30 years, Christine, and son Zak, with helping him stave off the darkness. Jazz has also helped, of course. "I keep coming back to jazz because of my high respect for the art form," he says. "With spontaneous composition one matures and expands one's experience, which leads to a high level that one wants to continue to grow and perfect. The higher up the mountain the more there is to see. It's a common thread among us all." Allan performed two shows at the Marquee Toorak in September to celebrate his career and acknowledge the many people around the world who have supported him since his diagnosis, with part of the proceeds going to brain cancer research. Both shows were sold out. "Part of the proceeds from the nights will go to the Zavod fellowship for Brain Cancer Research," he says. "My goal is to continue raising funds through my music for research to find a cure for this form of cancer. "The show is called 'It's About Time' because I'm finally putting out some CDs of my music." With a heavy heart, we wish to let you know that Allan passed away on the evening of Nov 28, 2016 at his home surrounded by his wife Christine, his son, Zak, his mother, Annie and close friends. He was diagnosed with Terminal Stage IV Inoperable Glioblastoma Multiforme (GBM) Malignant Brain Tumor in July 2015, and was only given 3 months to live. During the following 17 months, Allan continued to do what he loved best: perform. His last live public performance was in September -just 2 months before he died. Visit the Tributes to Allan page to read the eulogy by Dr. Alan Finkel, the Age Obiturary by Debbie Ellis and other tributes. Allan received the Medal of the Order of Australia (OAM) posthumously on January 26, 2017. Visit the Allan OAM award page to find out more. 1976 Recorded with the Billy Cobham Band, "Life and Times" Available on C.B.S. 1980 Solo Jazz Album, "What's New"
1985 Guest Recording Artist with "Australian Crawl"
1986 Film Score "The Big Hurt"
1987 Commissioned work for Australian Girls Choir "Rocking Along"
1988 Composed and Performed "Concerto Australiana" (Original classical/Jazz fusion three movement composition) Sydney Opera House with the Australian Youth Orchestra Bicentennial Australia Day. 1989 Film Score "A Sting in the Tail"
1993-1994 ABC TV Series "Secrets"
1995 Premiers Small Business Awards Gala Beethoven Concert, Solo Performance, Melbourne Concert Hall "Appassionata" Guest: Kate Ceberano, Patron. 1997-Current Australian Musician magazine Music Educator. 1999-2001 Special guest lecturer Melbourne University "Careers in Music". 2001 Music director for "Good Morning Australia"
2001 Melbourne University lecture by Zavod on "Careers in Music"
2001 Red Cross "Humanity United" C.D. "Concerto for Violin with Jazz trio and Orchestra". Synthesized version completed. 2008 Zavod Berlin Grigoryan CD: The Australian Concert Trio. Allan Zavod together with world renowned guitarist Slava Grigoryan and principal cellist with the MSO, David Berlin, recorded an album of original music by Zavod. 2010 Allan Zavod performing with Nigel Kennedy Live @ "The Basement"
2010 Environmental Symphony for Orchestra and Narrator to be performed Oct 15 at The Banksia Awards, Sydney, Narrator Sir Richard Branson Narrative written by Dr Alan Finkel AM World premier Sydney.Aus. 2011 Oboe Concerto "Resilient Spirit" performed by Queensland Youth Symphony & Diana Doherty (Oboe Soloist) at the Queensland Performing Arts Centre - Dedicated to the people of Queensland during the 2011 floods. 2011 Julie and Friends Concert To Benefit Cardinal Newman High School. 2013 Allan Zavod Live At Baker Street: "33 Thursday" Concert"
2014 Live @ Phnom Penh - Allan Zavod Live Trio live only at The Groove! 2015 "Good Vibrations" Concertato composed for Orchestra. World Premiere perfromed by the Queensland Youth Orchestra, Conductor John Curro AM MBE, at Q.PAC Concert Hall, Qld. Aus. 2015 Diagnosed with erminal Stage IV Inoperable Glioblastoma Multiforme (GBM) Malignant Brain Tumor in July 2015, and was only given 3 months to live. 2015 "Environmental Symphony" - Zavod's cinematic composition performed by the Melbourne Symphony Orchestra, including introductory narration and synchronised visuals, at Hamer Hall, Melbourne Arts Centre. All proceeds (over $100,000.00) went to the Royal Melbourne Hospital for GBM Brain Cancer Research. 2016 Allan Zavod was the featured performer at the June 2016 Australian Jazz Bell Awards at Birds Basement, playing in memory of those jazz greats that passed away in 2016. 2016 Dr. Allan Zavod's final public performances on Sept 14 & 28, 2016 at the Marquee Lounge Bar in Toorak: "Its about time" - CD launch, dinner and show. Part of the proceeds from the nights went to the Zavod fellowship for Brain Cancer Research. 2016 Allan passed away on the evening of Nov 28, 2016 at his home surrounded by his wife Christine, his son, Zak, his mother, Annie and close friends. 2016 A Tribute Night For The Great Allan Zavod. This special night is a celebration of Allan's lifelong dedication to music, his family and his friends, and will feature some of Australia's finest musical talent who have graciously donated their time in Allan's honour. 2017 The late Dr. Allan Zavod received the Medal of the Order of Australia (OAM) on January 26 2017, for service to the performing arts as a musician and composer.